Lot Detail - Frank Mahovlich's Early-to-Mid-1960s Toronto Maple Leafs Game-Worn Wool Jersey from His Collection with LOA - Team Repairs! 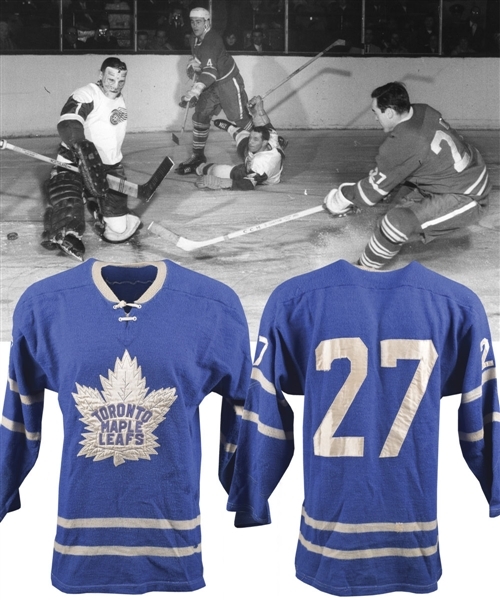 Frank Mahovlich's Early-to-Mid-1960s Toronto Maple Leafs Game-Worn Wool Jersey from His Collection with LOA - Team Repairs! Chicago Black Hawks owner James D. Norris once offered Harold Ballard one million dollars for Frank Mahovlich while the superstar was in a contract dispute, and with a deposit paid and a deal apparently made, the Leafs came to their senses, reneging on the deal the next day and returning the $1000.00. Born in Timmins Ontario and playing his minor hockey in the NOHA, Mahovlich signed with the Leafs and was sent for seasoning to OHA-affiliates the Toronto St. Michael's Majors. After 3 seasons with the Majors, The Big M would play his first 3 games for the Leafs in 1956-57, followed by 11 seasons representing the maple leaf along with additional years spent in both Motor City with the Wings and in Hockey City with the Habs. The Calder Memorial Winner in 1958, Mahovlich was part of 6 thrilling Stanley Cup championships, with appearances at every single All-Star Contest between 1959 and 1972, except 1966. 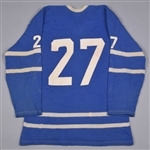 Enshrined within the Hockey Hall of Fame in 1981, Mahovlich’s number 27 would be retired by the Blue and White in 2016. Originating from his personal collection, we are thrilled to bring to auction a vintage Toronto Maple Leafs wool sweater that was worn by Mahovlich in the early-to-mid-1960s. A Doug Laurie label from the MLG supplier graces the inner seam, with the sweater measuring-out across the reverse to roughly a modern size 46. Featuring a detailed tackle twill Maple Leafs team crest with embroidered accents, “Toronto Maple Leafs” has been appliqued, with “27” over the sleeves and verso in single white twill. Dual-white striping bands have also been employed over the sleeves and lower band, with four eyelet configuration on tie-neck construction. 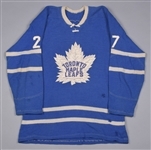 Dated to either the 1962-63 or 1963-64 seasons due to the specific angled font of each number “7”, both seasons are important, as the Leafs would win a trio of consecutive Stanley Cup championships early in the decade, in 1962, 1963 and 1964. Surviving in stunning condition with the wool material still soft and supple, the Leafs team crest remains clean and perfectly affixed, with threading missing from just a small section of the reverse “2”. Pilling has occurred within a number of spots – testament to the garments thorough use – with team repairs also present, with 4 large examples over the lower left front, with an additional pair over the verso. A quartet of unrepaired holes is also visible, situated over and near the right elbow. Hailing from a Stanley Cup championship season and worn by one of the most talented of all former Maple Leafs, this highly desirable wool sweater is deserving of placement within even the most elite of collections.